The Galbraith Aberdeen office reports a significant increase in sales for the final quarter of 2017 and it is apparent that demand from local buyers is underpinning the vast majority of activity. 96% of property sales recorded in the Aberdeen office in the final three months of 2017 were made to buyers from Aberdeenshire. Property sales in the region rose by 47% in the fourth quarter compared with the same quarter in the preceding year. Viewings of property also saw a year-on-year increase of 23%. The average price of properties sold by Galbraith in Aberdeenshire during the period was 477,799. The final quarter of 2017 was very positive. Year-on-year property sales have been recovering steadily following the downturn of the Aberdeen property market in 2015. The properties which are very much in demand are suburban and country properties in good condition, especially if they have land or paddocks. These are often selling quite quickly another sign of returning confidence. Deeside and Donside are perennial favourites and we find that properties in these areas usually attract a significant amount of interest. Royal Deeside has been well known to visitors since Queen Victoria and Prince Albert purchased a holiday home here 1852 and it remains in demand as a place to visit and a place to live. Donside is a destination for those who appreciate spectacular unspoilt scenery, wonderful walking routes and historic connections and again is in demand as a lifestyle choice. We expect 2018 transactions to continue in much the same vein. Property viewings have been very busy in recent weeks and we recently accepted an offer on a lovely house within two weeks of it going on the market. The critical aspect of achieving a sale is to ensure the property is priced correctly. The Old Manse of Towie is a stunning B-listed Georgian Manse in an elevated position commanding far reaching views across the Upper Don Valley. The property has trout and fishing rights on the River Don and there is a C- listed traditional steading with development potential included in the sale. Woolmill is a charming steading conversion enjoying a peaceful rural location in Mill of Craigievar. There are excellent facilities for the equestrian enthusiast with five acres of paddock, a floodlit outdoor arena and two stables. Woolmill is a unique opportunity to acquire a superb family home with excellent outdoor facilities in a beautiful location. 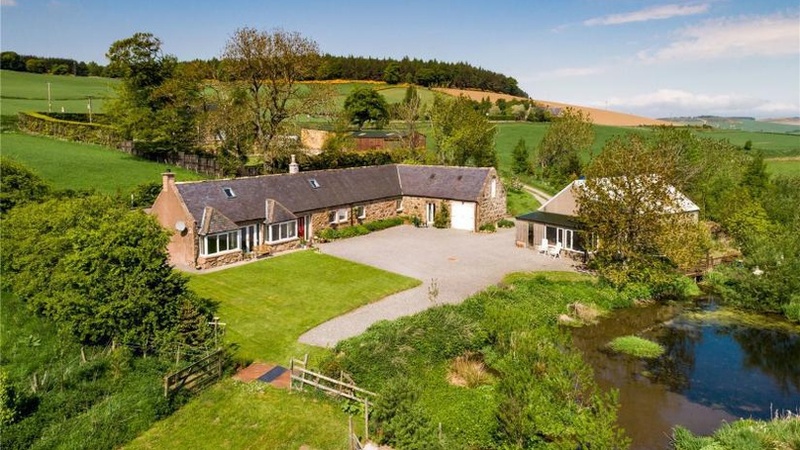 This property comprises a superb three-bedroom farmhouse and six holiday cottages, some of which are on situated in a woodland area and on the banks of the River Deveron. There is a further steading which has outline planning permission to be converted into a holiday cottage. 11.4 acre site including four grazing paddocks.